A materials company grew sales by 35% after repositioning 12 months ago. In order to effectively sell, you'd better understand who you're selling to. Whether focusing on a company, division, product or specific initiative, Launch Team can develop a market positioning strategy to ensure your success. Our proven positioning process works to narrow your focus by developing distinct buyer personas and crafting the messages to match. We help you develop a marketing plan that corresponds with your business plan, resulting in actionable, measurable steps to move your company forward. Typically preceded by a marketing assessment, the positioning process begins with extensive market research culminating in a positioning workshop for key players – including CEO, COO, VP of Sales and Marketing, and Product Managers. We address findings and recommendations before establishing a final deliverable package. "Launch Team branded Sydor Optics, and we receive compliments on their work to this day." Contact us today to set up your positioning workshop. 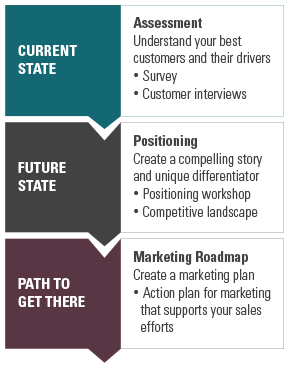 Workshops also provide the necessary input to create your marketing roadmap. This roadmap helps you plan activities for a product launch, a specific campaign or for the year, ensuring that your marketing reaches customers in the right place at the right time.